The United States Lightship Museum is extremely grateful for the generosity of the following donors who have contributed to the Museum and the restoration and preservation of Nantucket Lightship / LV-112, a National Historic Landmark and important part of our nation's maritime history. We are also very thankful to all the individual USLM members and donors who have contributed to our cause. 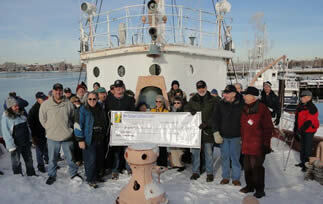 Crandell Dry Dock Engineers, Inc.
Members of the New England Lighthouse Lovers (NELL) on board LV-112 on a cold mid-winter day, present a check for $3,000 to the United States Lightship Museum's Nantucket/LV-112 restoration project. NELL's donation will be directed to the restoration of LV-112's radio beacon control room.